While markets are being somewhat drama queen-ish this morning, China's trade war retaliation was telegraphed well in advance, and as we reported nearly two weeks ago, "China About To Launch "Tens Of Billions" More In Tariffs." As such it should not have come as a surprise that China did just that overnight, when it announced 25% tariffs on $50 billion in 106 US imports. What was a surprise, was the unexpected announcement that China would also include US soybean exports in the list of items impacted by tariffs, something which we noted earlier opens up the door to a new, third round of tariffs by the US, which would assure that a "nuclear" trade war has indeed broken out. 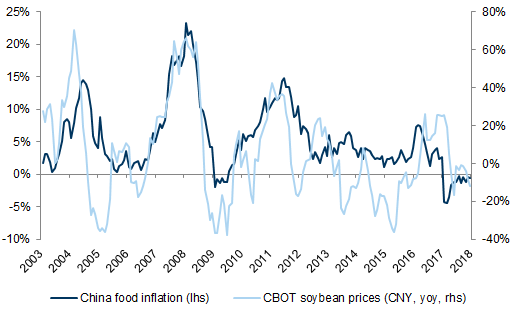 It is the presence of soybeans in the tariff list that has startled China watchers and analysts, such as Capital Economics' Julian Evans-Pritchard, who writes that "China’s rapid and aggressive response to the proposed US tariffs has raised the stakes for both sides." What makes the inclusion of soybeans so surprising? Perhaps nothing more than the fact that while China is seeking to hurt US exporters, it will also substantially and materially impair its own domestic producers and supply chains, will struggle to replace U.S. soybean supplies "inflicting severe financial pain on domestic companies, analysts and executives at feedmakers said" according to Reuters, and potentially risk sparking runaway food inflation as surging feedstock prices send pork prices through the roof. To be sure, from a trade war perspective the inclusion of soybeans makes perfect sense: for China, the world's top importer of the oilseed in the world, soybeans are considered one of the most powerful weapons in Beijing’s trade arsenal because a drop in exports to China would hurt Iowa and other farm states that backed U.S. President Donald Trump. 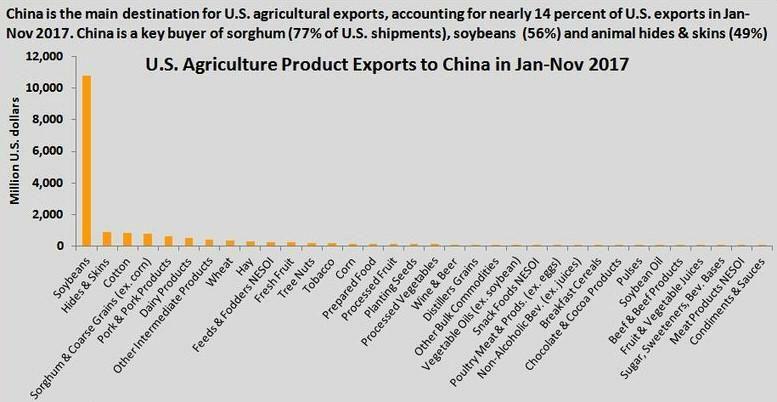 As the chart below shows, soybeans were the biggest U.S. agricultural export to China last year at a value of $12 billion. China's ravenous appetite for soybeans - the country's purchases hit a record last year and China eats up about 60% of globally traded soybeans - is because it needs to feed the world’s largest livestock industry including 400 million pigs, which in turn provides food for the world's biggest human population. Factories crush the oilseed to make meal - a key ingredient in animal feed. There certainly isn't enough production at home: China grows only about 14 million tonnes of soybeans, mainly to make food for human consumption, making it especially reliant on foreign imports, and thus, the US. In short, by crippling US soybean imports, China may have shot itself in the leg. First, some statistics: Brazil supplied half of China’s imports last year while the United States shipped around 33 million tonnes, about a third of the total. It is replacing those U.S. tonnes that will be no easy feat, if not impossible: crops in Argentina, the world’s No. 3 producer, have been hit by a drought, cutting exports from there to less than 7 million tonnes in the 2017/18 season, its smallest in a decade, according to the U.S. Department of Agriculture. Outside of Brazil, the United States and Argentina, about 17 million tonnes of soybeans comes from a handful of countries. To be sure, China has some emergency options, but the danger with all is that they could unleash a wave of inflation in a repeat of the events of 2011. Among China's "Plan B" options include tapping the government’s emergency strategic reserves and rejigging the ingredients that go into feed, analysts, experts, traders and buyers at feed mills say. “Some people say they could just drain their state reserves. That’s a possibility, (but) nobody knows how many tonnes are in it,” said U.S. Soybean Export Council Asia Director Paul Burke. According to Reuters, some feedmakers are already quietly drawing up contingency plans, such as finding substitute ingredients with feed mills reportedly adding more corn, distillers’ dried grains (DDGS), a byproduct of ethanol production, or rapeseed and cottonseed meal to their feed. But the risk is that adjusting component weighings could impact the overall food system, as maintaining protein levels is complicated. The maximum amount of DDGS in feed is around 20% and toxic ingredients found in rapeseed mean it can only make up 5 percent of pig feed, and it usually isn’t put in sow or piglet food. But an even bigger risk is inflation. 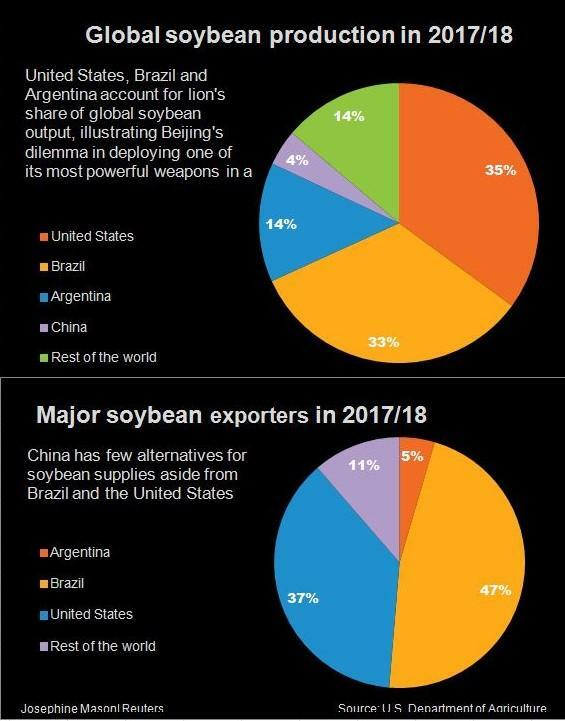 As U.S. soybeans become more expensive, importers will have to source from other countries, most notably Brazil and Argentina, which will immediately yank their own soybean prices as their biggest competitor has dropped out of the market. In fact, the threat of action has already pushed Brazilian export prices to all-time highs and fueled gains in domestic soybean and soymeal futures prices. Well, you get it from whoever is willing to sell, which they will: for a price. And as costs for hog farmers rise, that risks increasing the price of pork, a component of China’s consumer price index. And should food inflation rise too high, rumblings of social instability will re-emerge, as we saw back in 2011, and which prompted the Chinese government to rapidly tighten financial conditions in the process unleashing financial chaos around the globe and - according to some - the next leg of Europe's sovereign debt crisis. Which means that the inclusion of soybeans in China's tariff list has changed everything: on one hand it shows that China is dead serious in its retaliation and hopes of hurting Trump supporting farmers; on the other it may have started the countdown on its own spike in pernicious, food inflation, the outcome of which could be social chaos and instability, an outcome which Xi will hardly be excited about but which will be music to Trump's ears as both superpower leaders dig in for what appears to be a period of extended trade trench warfare.